AMY Gets Off To A Big Start At The Box Office! AMY, Asif Kapadia’s stunning and intimate portrait of Amy Winehouse, got off to a big start at the box office over the July 4th holiday weekend. The film garnered $222,500 from just 6 screens for a per screen average of $37,083, by far the highest among all releases over the weekend and one of the highest limited debuts of the year. With these early domestic sales, AMY is looking to be one of the biggest documentaries of the last decade. 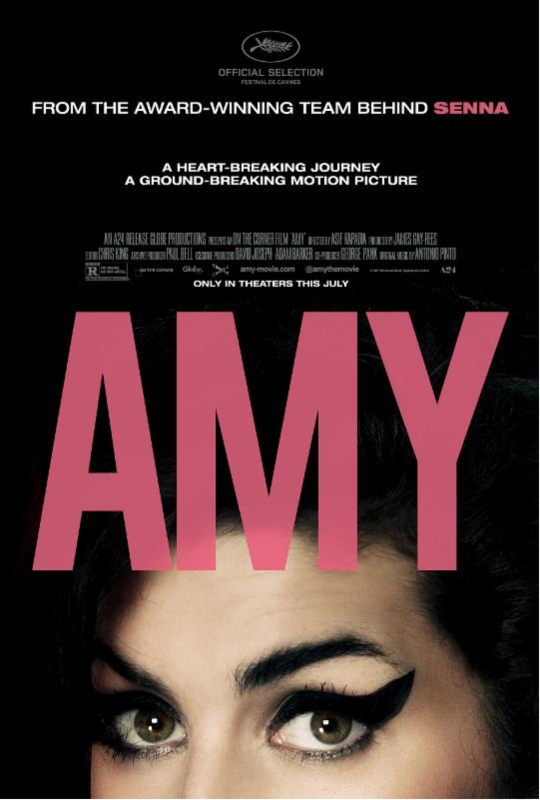 AMY has been enthusiastically received by critics and audiences alike with an incredible 97% positive rank on Rotten Tomatoes and an audience approval rating to match. The film will expand nationwide this coming weekend. Acclaimed director Asif Kapadia (SENNA) and Amy’s first manager and long-time friend Nick Shymansky will both be in the states and available for interviews this week. From BAFTA Award-winning director Asif Kapadia (SENNA), AMY tells the incredible story of six-time Grammy-winner Amy Winehouse – in her own words. Featuring extensive unseen archival footage and previously unheard tracks, this strikingly modern, moving and vital film shines a light on our culture and the world we live in today. A once-in-a-generation talent, Amy Winehouse was a musician that captured the world’s attention with her unforgettable voice and charisma. A pure jazz artist in the most authentic sense, Amy poured her heart and soul into her music, expressing personal struggles and pain through her intimate lyrics. The combination of her raw honesty and virtuosity resulted in some of the most unique and adored songs of our time. Amy became an international sensation, experiencing a meteoric rise to fame she had never sought nor expected. The relentless and invasive media attention, coupled with Amy’s troubled relationships and addictions, led her into a tragic cycle of self-destruction, resulting in her untimely death at age 27. Four years later, Asif Kapadia’s powerful documentary invites audiences to remember and celebrate Amy as a brilliant artist while asking ourselves how it was that we watched her disappear in front of our eyes.